Sophisticated switch that can distinguish between your voice and room noises! The loudness of sound required to activate the relays. The duration of the sound. The Voice Switch is unique because you can select between having it listen to only human voiced sounds or all sounds. A microphone is required. 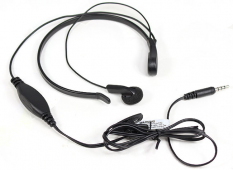 Two are offered by InvoTek, a standard "ear-bud" microphone and a "throat microphone". The ear bud microphone is a lapel mic with a small ear-bud speaker. It is the best choice if you want to use a sound other than a voiced sound (such as a vowel sound that activates the vocal cords). 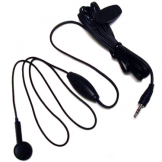 The throat mic does not pick up ambient sounds, so it can be used to avoid accidental switch activations from noises in the room. Please make this selection when ordering. You can also use any "universal" style cell phone microphone. With Voice Switch you can use your voice or another sound to control technology. With this switch and an appropriate controller you can turn on and off a light, toys, computer games, and appliances. The switch is unique in that it can distinguish between human voiced sounds and other sounds. The Voice Switch is also effective in training sound production capability for persons whose speech has been limited by injury, illness, or surgery. Voice Switch contains special software that analyzes an incoming sound to determine if it human speech. The switch can be setup by the user to only accept speech sounds, or accept any sound (including speech sounds) that meets the input requirements. Two knobs on the Voice Switch top panel enable the user to set the sound duration and volume required to activate the two output relays. One relay is activated on short sounds and the other is activated on longer sounds. The third knob adjusts the volume of the auditory feedback to the user indicating that a sound has met the input requirements. The Voice Switch activates one of two output relays for one-tenth of a second (100 msec) when a sound meets the front panel settings. The Voice Switch contains a special mode activated by setting the sound duration knob to its minimum setting. In this mode, the primary output relay is activated for the entire time that a sound is active. This enables "click and drag" capabilities for people who want to use the switch as a left mouse button.